Medicare Premiums for 2017 were announced a few weeks ago, which got me looking at retirement healthcare spending. In retirement projections for our clients we use healthcare cost estimates shown in Exhibit 1. Medicare Part B went up by 10% to $134 a month for new enrollees. That’s the base rate, if your 2015 income was over $170,000 (married) it goes up to $187 or higher (up to $428 a month). 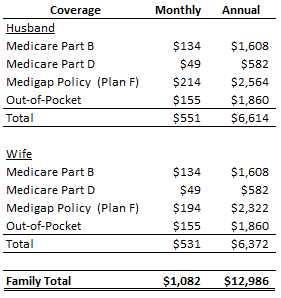 Part D is relatively inexpensive, but Medigap (or Medicare supplement) policy runs about $200 for Plan F (our preferred option). There are still some co-pays and out of pocket costs of about $150 a month. All in all, at age 65 a married couple can expect to spend about $13,000 on healthcare costs in 2017. However, the scary part of this analysis is not the starting level of $13k but how fast it goes up in the future. These costs are projected to increase at 6-7% per year versus general inflation of 2-3%. Exhibits 2 and 3 show what that means in the long run. Let’s assume that medical expenses increase at 6.5% per year (quite realistic based on history) and all other retirement expenses increase at 3% (slightly generous). Let’s also assume 30 year retirement (longer than average) from age 65 to 95. If we use starting level of $13k for medical and $84k for all other expenses ($7,000 per month), medical comes out to 13% of total at age 65. 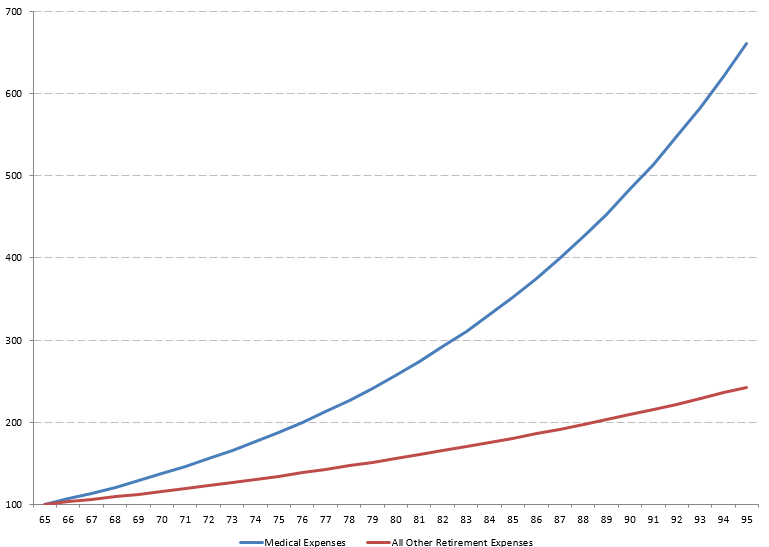 However, that share more than doubles to 30% of total by age 95 (Exhibit 2). Exhibit 3 shows what happens if we index these 6.5% and 3% growth assumptions – over 30 years medical costs increase by a factor of 6.5 versus 2.5 for everything else. The main takeaway is that healthcare costs in retirement are significant and become more so over time. Make sure that you take this into consideration or discuss it with your advisor! And this is just Medicare, which is the easy / cheap part. People that retire before 65 have to deal with much tougher choices and higher costs. ACA (Obamacare) health plans started out being quite attractive in 2014, but deteriorated into very unappealing choices for 2017. Pima County basically has two plan from one provider and they are exceedingly pricey and coverage/network options leave much to be desired.